Subjects, styles, advertising, other relevant information: This firm remains something of an enigma. No trace locally has found to date beyond the three directory entries and the photographs below. 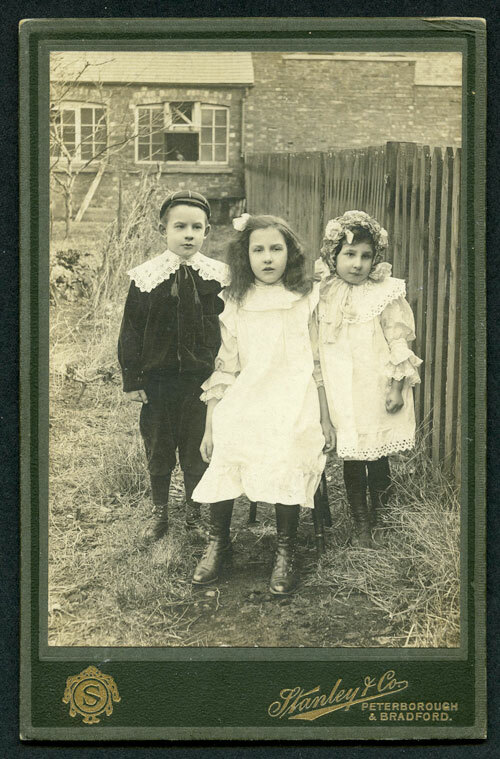 The first is a cabinet photograph taken outdoors in a garden of a group of three children c, 1910. The reverse of the mount is blank, the mount is dark green and the lettering "Stanley and Co Peterborough and Bradford" is gilt. 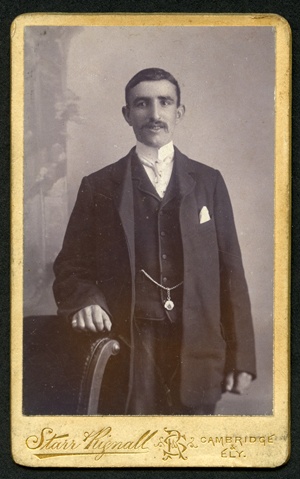 The second, another cabinet photograph is reproduced with the permission of David Hodson, and is a a portrait of an unknown member of the the Hodson family who lived at Yaxley. This is another natural light photograph, which appears to have been taken in a back garden. 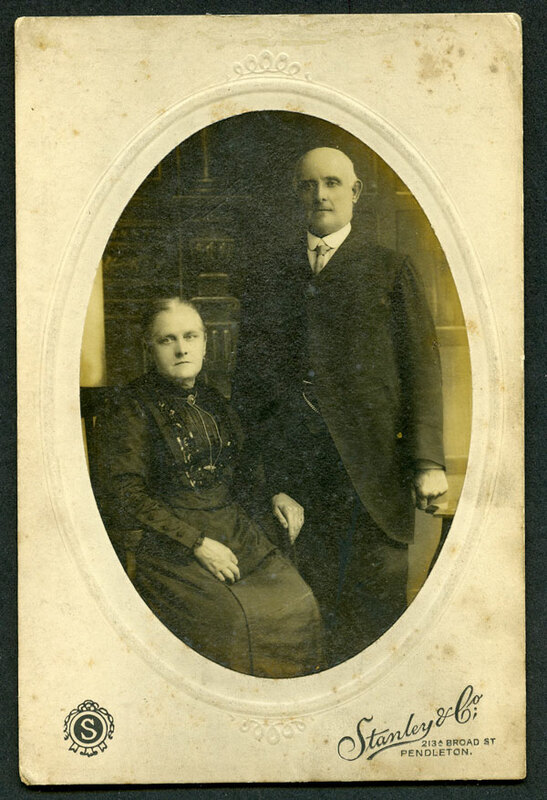 The third is an oval photograph of a couple c.1910 on a 6.5 x 4.5 inch mount with the legend "Stanley and Co 213A Broad Street, Pendleton" in black lettering, reverse blank. This portrait appears to have been taken in a studio. The style of printing on all three mounts, the same name, similar "S" monograms, and the fact that Pendleton is close to Bradford, suggests these are from the same firm. In the 1901 census the address of 111 Cromwell Road Peterborough was occupied by Zacchens Brown b:1874 Peterborough who had a dairy shop and did milk delivery. The 1911 census lists a photographer living at 111 Cromwell Road Peterborough, but his name was Simmons, not Stanley. 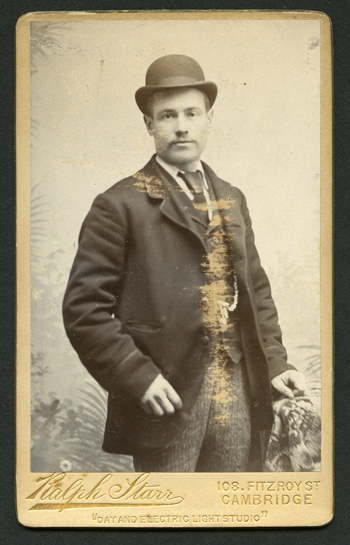 His full details were: William Henry Simmons, b: 1861 Plymouth, a photographer working on his own account from home. Living with him was his wife Elizabeth Simmons b: 1874 Northampton. William Henry Simmons was recorded as a photographer in an 1890 Directory at Notte Street Plymouth. Also in November 1890 William Henry Simmons, 52, Notte Street, Plymouth submitted to Stationers' Hall for copyright purposes a photograph of officers of HMS 'Serpent' (TNA COPY 1/402/311) According to a Plymouth Trade Directory 1885 52 Notte Street was occupied by another photographer, T.S.Roberts. The census return in 1911 places William Henry Simmons at 111 Cromwell Road at exactly the same time as the local diectory entries list Stanley and Co at the same address. At 213A Broad Street Pendleton in 1901 was a William Frost, a tobacconist, living with his three daughters and one son. 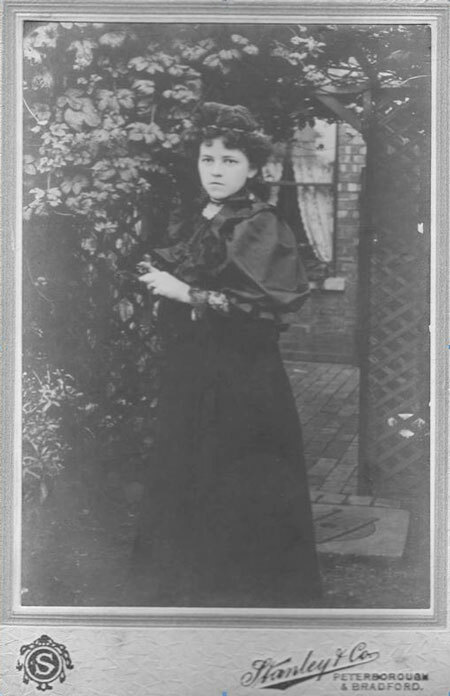 By 1911 however there was a photographer at the address, who was Stanley Crippin, b:1886 Wigan, and his wife Edith. Stanley Crippin was the son of Edward Robert Crippin b:1856 Manchester, a carrier's agent in 1891 and a licensee of the Dog and Partridge in Wigan in 1901. Edward Robert Crippin had a long standing interest in photography, first as an amateur, then as a professional. The Wigan Observer and District Advertiser listed him as an officer of the Wigan Photographic Society on 18 May 1888. There are a number of newspaper reports mentioning Crippin taking photographs at events between between 1893 and 1900. In March 1894 Edward submitted to Stationers' Hall for copyright purposes a 15 x 12 photograph of the 'Bolton Wanderers Football Team'", copyright owner of work: Edward Robert Crippin, Spring Bank, Pemberton and Elizabeth Crippin, Spring Bank, Pemberton, Copyright author of work: Edward Robert Crippin, Spring Bank, Pemberton. (http://discovery.nationalarchives.gov.uk/details/r/C9351105) This National Archive entry suggests that Edward's wife was involved in the Crippin photographic business. When he was initiated into the Lodge of Antiquity No 178 at Wigan on 16 September 1896 Edward gave his occupation as photographer. On 9 March 1900 The Wigan Observer reported that Messrs Crippin and Co of Spring Bank Pemberton had published a series of photographs of principals who took part in performances the previous autumn by the Wigan and District Operatic Society of the Mikado and Iolanthe. Crippin was employing others. On 14 Sept 1900 a rival firm, The Pemberton Photographic Company, opened a studio at Spring Bank Pemberton advertised as "under the management of Mr Skewse (late with Crippin and Co)". On 10 January 1903 the firm advertised: "The Mayors Juvenile Fancy Dress Ball - parents desiring photographs of children in fancy dress should make arrangements with Messrs Crippin and Co Ltd - all photos will be taken under the personal supervision of Mr Crippin himself. Appointments can be made at the Dog and Partridge Hotel next door to the Post Office". On 30 July 1904 Crippin and Co advertised the opening of their new Borough Studio, Market Square Wigan. "Come and see the new Electric Light Photography. For one month Messrs Crippin and Co will present to each customer ordering 1 doz Platinotype photographs, a nicely finished enlargement in sepia or black and white. At Crippin's studio daylight is not essential. Studio hours 9 am to 6 pm, after 6pm sittings by appointment. Market Square, Wigan and Meek's Buildings, Wallgate". Advertising by Crippin and Co last appeared in the Wigan Observer and District Advertiser in 1906. 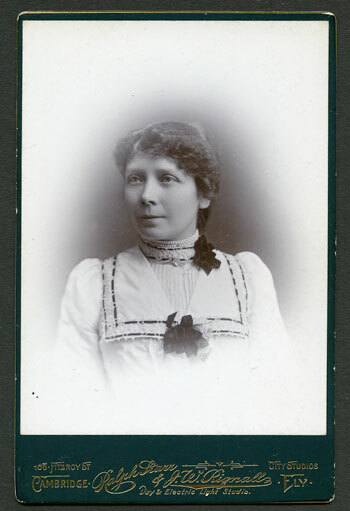 Manchester Archives in their catalogue item 1927 "Photographs related to Mr and Mrs Butler and family" http://discovery.nationalarchives.gov.uk/details/r/8abf73aa-6a9b-420c-8d4a-e7c88fbcebc5 state "Dora Crippin (born 1882) was the eldest of 3 children of Mr. ? Crippin and his wife Elizabeth. 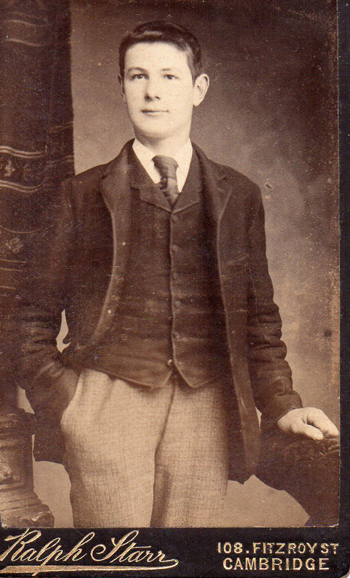 Mr. Crippin was a studio photographer in Pemberton near Wigan. Dora's two brothers Stanley and Will took over the business on their fathers death but subsequently quarrelled, parted and went their own ways. Stanley finished up as an optician in Pemberton." Could it have been Stanley Crippin's first name used in the firm's name? 1910 was the year that Hawley Harvey Crippen, the murderer, was arrested and tried in a case which generated enormous publicity, so a photographic firm called "Crippin and Co" might suddenly have found themselves with a toxic brand name almost overnight. From 1910 there was a chiropodist, not a photographer, operating from Borough Studio, Market Square, Wigan. Stanley Crippin, photographer, died on 23 May 1916: his address at the time was 213A Broad Street, Pendleton, Lancs. 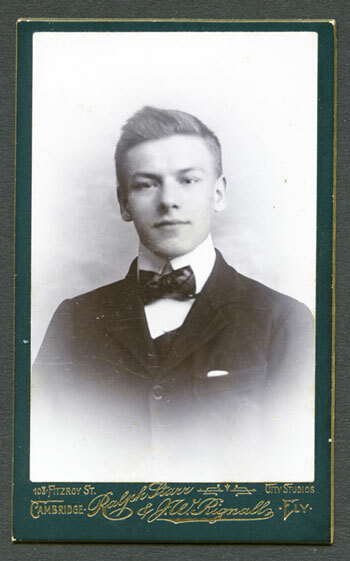 In 1911 Stanley's brother, Will Mather Crippin, b:1888 Wigan, was boarding at a lodging house at 113 The Grove Ealing - he was single and his occupation was shown as a water colour artist, not a photographer. It is still not currently known what connection Stanley Crippen had with Peterborough or with William Henry Simmons. Subjects, styles, advertising, other relevant information: The 1911 Census shows Stallan at his parents house in London Rd Sawston, working as a photographer on his own account. 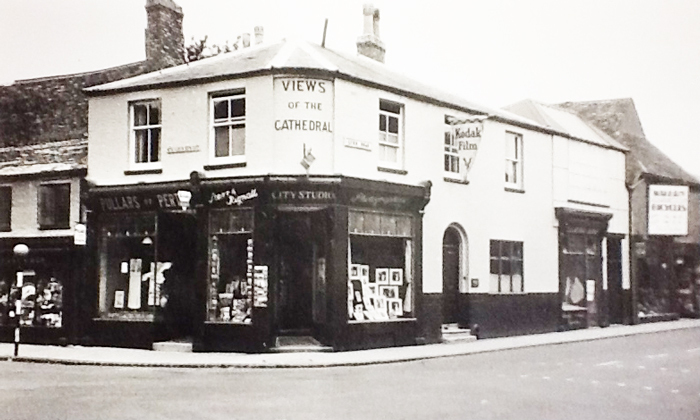 Address: Mill Road Cambridge, 108 Fitzroy Street, Regent Street, in 1933: 85 Regent Street Cambridge, 1 Lynn Road Ely: receiving depot 2 Wellington Street Littleport. Subjects, styles, advertising, other relevant information: Ralph Starr learned the photographic business working for Hills and Saunders in Cambridge before setting up on his own in Mill Road briefly, then from 1887 at 108 Fitzroy Street Cambridge. In 1900 he opened another studio in Ely and another in Regent Street. Ralph Starr served two terms at Cambridge’s Mayor, 1918 and 1948. In the 1939 Register Ralph was listed as a retired photographer living at Rosemont, Newmarket Road, Cambridge. 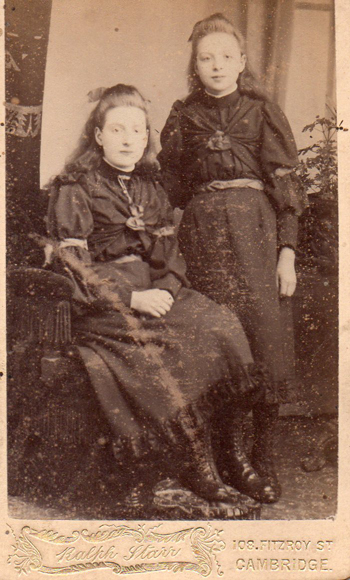 At the same address were: Eliza Starr b: 14/9/1872, single and Elizabeth Starr b: 13/11/1874 single. A number of Ralph Starr's photographs are shown below. The first two are thought to be from his earliest works. 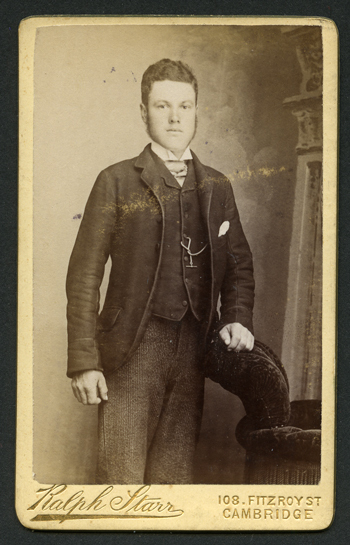 The first is a carte de visite with a 3/4 length portrait of a standing young man. The mount is plain black card with gilt writing. On the face is "Ralph Starr 108 Fitzroy Street Cambridge". The reverse is blank. (Michael Brown Collection). Beside it is a portrait of two girls, presumably sisters. The same text is on the face of the mount, but impressed into a cream card with blank reverse. (Michael Brown Collection). 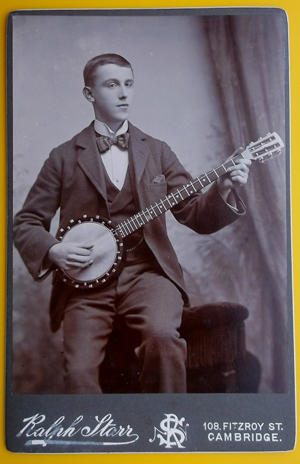 Below this is a cabinet photograph from the Simon Shirley Collection of an unknown man with banjo. The mount of this carte is grey, the reverse blank and the print on the face and edging are in white - the text on the face says "Ralph Starr 108 Fitzroy Street Cambridge" with a monogram with an intertwined "R and S", believed to be 1890s, a peak in banjo popularity. 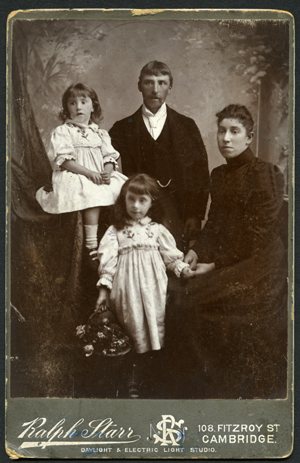 Beside this is another cabinet photograph from the author's collection, a family portrait c.1890s, mother, father and two girls on grey mount on which is written in white “Ralph Starr 108 Fitzroy St Cambridge Daylight and Electric Light Studio” with a similar monogram. Again the reverse of the mount is plain card. Presumably the carte with the additional advertising information is the later of the two. Next are two cartes de visite of unknown gentlemen, cream mounts with gilt chamfer edges, and gilt writing. Both have the 108 Fitzroy Street address, one has "Day and electric light studio". 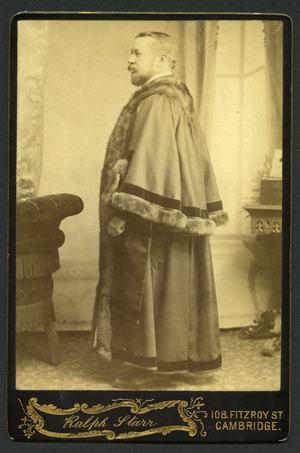 Below these is another Cabinet photograph, a side profile of a standing figure in Mayoral robes. The mount is black with gold lettering and edging. From other surviving photographs of Cambridge Mayors, this does not seem to be a self portrait of Starr as the Mayor of Cambridge in 1918, but probably dates from the 1890s. 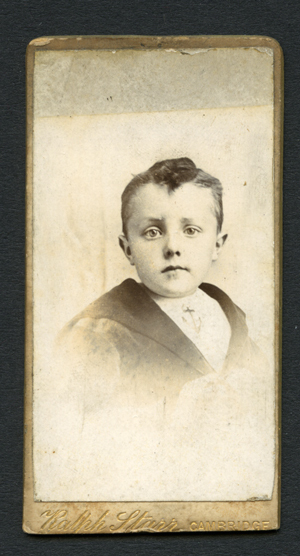 Beneath that is a very rare "midget" carte de visite of a young boy in a sailor shirt and a jacket which looks several sizes too large for him, c.1890s. The size of this is 3 inches x 1.5 inches. The mount has "Ralph Starr Cambridge" in gold lettering beneath the image - it is on cream card with gilt edges. A couple of millimeters seem to have been trimmed off the bottom edge, perhaps to fit this into an album or wallet. The reverse of the mount is blank. Cambridgeshire Collection’s Carte de Visite Collection c.65.5 has 22 cabinet photographs with 3 variations in mounts from Ralph Starr. Cambridgeshire Collection’s Carte de Visite Collection c.65.5 has a cabinet photograph by Gates and Starr. 108 Fitzroy Street and High Street Ely in Kelly’s Directory of Cambridgeshire 1916. There was an advertisement in the Cambridge Independent Press for 6th July 1917 for a "respectable young lady and boy" to join the firm - applications to them in writing at Fitzroy street Cambridge. 43 Fitzroy Street; Spaldings Directory of Cambridge 1920-26. 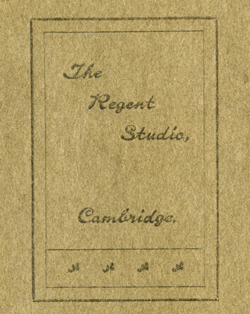 See also REGENT STUDIO Spaldings Directory of Cambridge 1901-26 – in the Directories for 1927-8, 29-30, 30/31, 31/32,32/33 the entry is shown as Regent Studio (Starr and Rignall) 85 Regent Street. Rignall was living at this address in the 1911 census. Subjects, styles, advertising, other relevant information: The firm was a partnership between Ralph Starr and John William Rignall. See below: a carte de visite, c.1905 of an unknown young man, cream mount with gilt edges and writing on the face "Starr & Rignall Cambridge and Ely" with a S&R monogram. Reverse blank. This appears to be a carbon print, not having faded or turned sepia over time as do albumen prints. Next, a carte de visite, c.1905 of an unknown young man, again a carbon print on a more lavish, presumably later, dark green enameled mount with square corners and gilt edges,beneath the image in gold lettering "Ralph Starr and JW Rignall 108 Fitzroy Street Cambridge City Studios Ely" Next to this is a cabinet photograph on a similar mount. 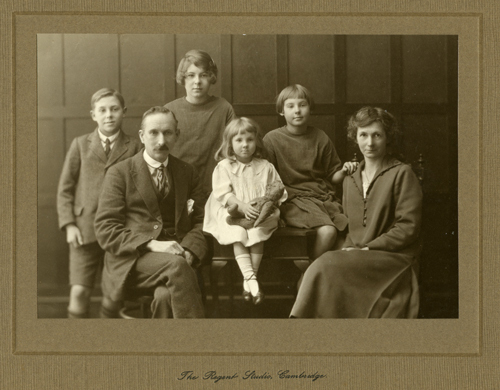 Beneath this is a studio portrait of a family from The Regent Studio Cambridge, c.1930, approx 6 x 4 in on brown folder mount, detail from the cover appears below the photo. 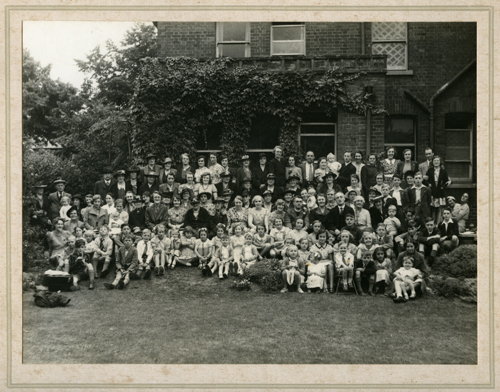 Next is a mounted 8 x 6 inch print which appears to be from the 1950s, (but must be a bit earlier given the firm's directory entries) of a Garden Party at 96 Chesterton Road Cambridge (now the Red House Doctor's surgery). The mount is cream imitation linen finish card with double green lines round the image. 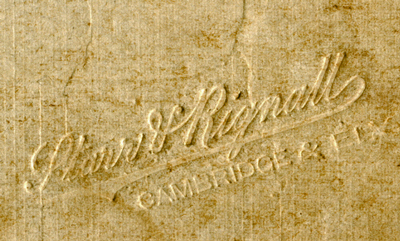 The photographers name "Starr and Rignall Cambridge and Ely" is impressed in the bottom RH corner of the mount, possibly in-house with a small hand embossing machine, shown in detail below. Next are two different products from the studio. 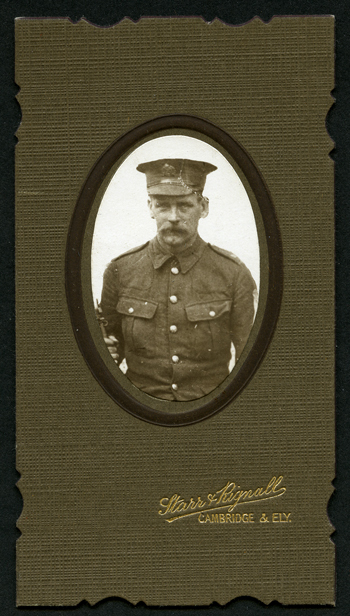 The first is an oval print of a soldier in uniform in a 5.5 x 3in die cut scolloped dark brown mount with gilt lettering. The uniform of the subject appears to be from WW1, but close examination shows the image to be a copy of an earlier photograph, so this may be from the 1920s. The second different product is a circular print mounted on a 5 in square mount, graduated grey to cream, with white lettering. This could be again from the 1920s. 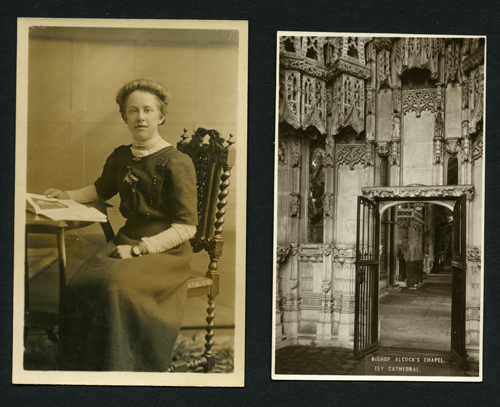 Also below are two real photograph post card images from the firm, probably around 1910-20 - they have divided backs with place for stamp marked, but no postal rates. Also scanned are details from the rear of three real photo postcards showing the firm's name. 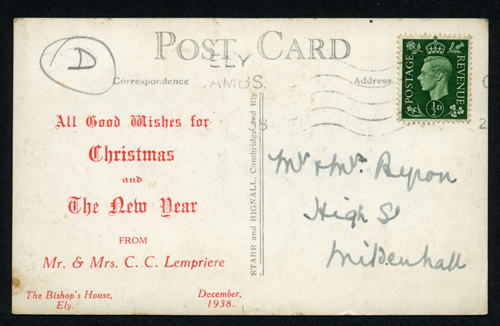 Below this is a Starr and Rignall Ely view, over-printed with seasonal greetings in 1936. Below this is a 5 x 3 in portrait of a sailor and soldier from WWII by "Starr & Rignall City Studio, Ely" and a 1930s portrait (postcard back) of a little girl with soft toy (Pat Saddington Collection). Next is a 5.5 x 4in image of an unknown lady in snakeskin shoes. The mount has the name "Starr and Rignall" and the address "City Studio Ely." Next is a photograph which illustrates a different part of the business of Starr and Rignall. This postcard is typical of the seaside town commercial street photographer who snapped away at holiday makers offering them the chance to call later at the studio to pick up a print of their photograph. These "Walking Photographs" were also offered to the customer as postcards for them to send back home to friends and relatives. 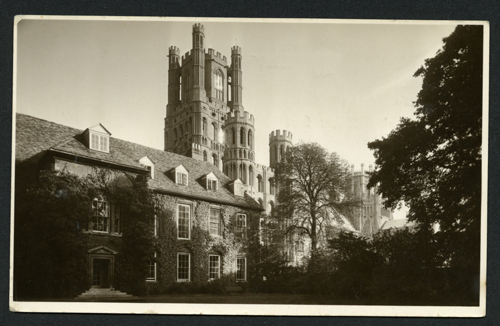 This example has the name on the reverse of Cambridge and Ely photographers Starr and Rignall. The little girl has a bucket and spade suggesting the seaside. 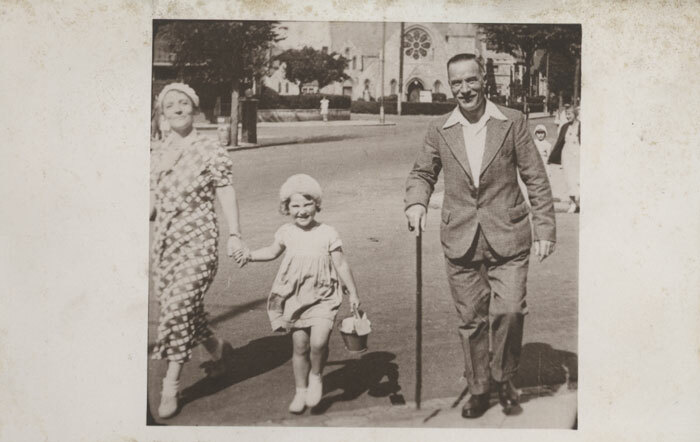 We are most grateful to Paul Godfrey and Simon Robinson for identifying the location of this photograph as Pier Avenue, Clacton. 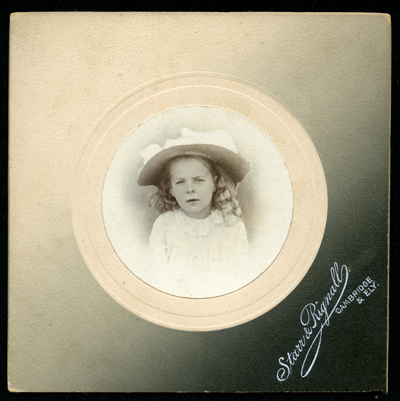 Paul writes, " I would conjecture that your Starr and Rignall photo was one of three taken in a strip with a 35mm Cine camera and has been specially printed at a later date as a postcard. Most cine camera walkie strips are three inches wide or a slightly larger three and a half inches wide and about seven inches long. I know of two operators in Clacton taking this type of walkie photo. One is Sunfilms and I know very little about them. The other is Empire Films run by James Hobson. Empire Films were the photographic concession holder at the Butlin Holiday Camp at Clacton before WW2. After WW2 Butlins had their own photographic company and Ilford Limited were part owners." Solving the mystery of the location leaves another unanswered question. What was a Starr and Rignall photographer doing taking street photographs at Clacton. Did a photographer from Starr and Rignall go to the coast in the summer to take on this sort of seasonal work to expand the business? 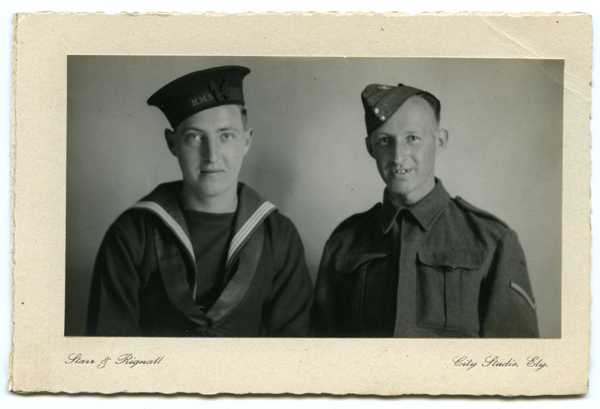 Or could this be Starr and Rignall doing developing and printing work for customers, and this is a customer's photograph printed with a Starr and Rignall postcard back? If you are interested in Walking Photographs generally, take a look at this excellent site on the subject: https://gohomeonapostcard.wordpress.com/. There is more on Walking Pictures in Cambridgeshire on our site at www.fadingimages.uk/walking.asp. Kellys Directory 1933 and 1937 Starr and Rignall 85 Regent Street Cambridge, 1 Lynn Road Ely plus in 1933 a receiving depot 2 Wellington Street Littleport. Another different product, perhaps from the 1920s, with a circular print of a young girl in a 5 vin square grey / ceaem graduated mount with white lettering. 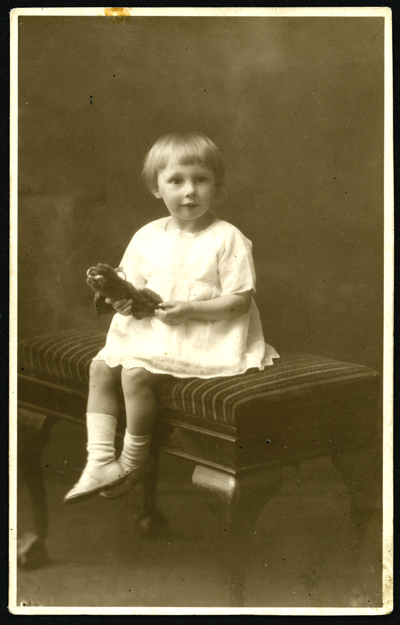 1930s Starr and Rignall, Cambridge and Ely portrait of child with soft toy. 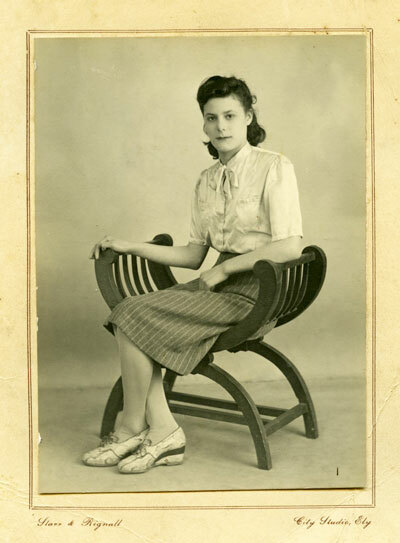 1950s portrait of unknown woman in snakeskin shoes, from the City Studio Ely.